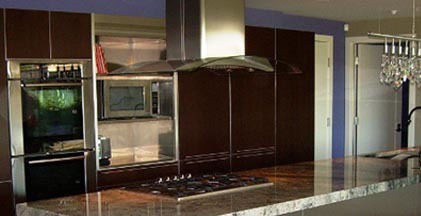 If you are searching for Island Range Hoods, in Arizona or California; Artistic Alloys & Design, LLC can help! We fabricate many kinds of custom range hoods including island range hoods from nearly any kind of metal including copper zinc, iron, stainless steel and a lot more. To obtain a free island range hood estimate in Arizona or anywhere else, give Artistic Alloys & Design, LLC a call today at (480) 941-2611. A ductless island range hood compromises of a fan (or a blower, motor) with a charcoal filter that draws up grease particles, heat, cooking smells, and smoke, filters it, and then rereleases it back into the kitchen. A ducted island range hood requires a ducting system to already be installed in the house and of course, above the stove – the smoke and smells are ducted outside the building. To conclude: A ductless island range hood is better than not having a range hood, but it won’t ever give you the same performance as a ducted island range hood. View our selection of ducted range hoods and ductless range hoods. If you live in Arizona or California and you want an island range hood to enjoy cooking in your kitchen, even more, give our highly skilled island range hood fabricators and installers a call today at (480) 941-2611. To make your island range hood dream a reality, we can come out to your home and consult with you. If your project or home is outside the state of Arizona, please contact us with your measurements, themes, and ideas. We’ll start right away on the design and send it with a quote for your approval. Once we have your approval of the design, we will start on fabricating your island range hood, then, carefully package it to be shipped, and send your new island range hood right out to you. We fabricate island range hoods with just about any type of metal including wrought iron, copper, zinc, and any other alloy you would love to have as part of your kitchen design. We will design, fabricate and install your island range hood to make a superb addition to your kitchen. Call Artistic Alloys & Design, LLC today and get your island metal range hood started so you can enjoy cooking, enjoy your kitchen and enjoy your home even more than you do already! When remodeling a kitchen, building or purchasing a new home in Scottsdale, Paradise Valley or anywhere else in Arizona, island metal range hoods can really give your kitchen a fine touch of class. They can be just as functional as they are beautiful. Successfully exhausting the steam and the smoke from cooking will help maintain high-quality air throughout your home. To set your home apart from the rest with beauty and to keep air quality healthy, use the best island range hood designer in the business, Artistic Alloys & Design, LLC! If you have a home in California and want to install a new island range hood, and want the highest quality and most custom options, you need to order it from Artistic Alloys & Design, LLC. You can decide on the style, type of metal, size, and more when you order from the wide variety of island range hood options. Our island range hoods are visually impressive and fully functional! You are in the driving seat as you can send us your inspiration and your ideas for your personalized design, or you can let us know the style you’re curious about and we can start on a design for you. We design and fabricate island range hoods and ship them nationwide for our clients. We also offer an installation service anywhere in the Phoenix, Arizona area. If you want to get a free ductless range hood quote in Scottsdale, anywhere else in Arizona, California or any other part of the US; please give Artistic Alloys & Design, LLC a call today at (480) 941-2611. I needed something that was aluminum welded and had no means to do it myself. I called them at 8:30am asking if they could do a small job for me before the end of the day. I was told that depending on how small the job was that they should be able to have it done before 3:30pm. It didn`t even take that long because five hours later my job was done! Scott provided great communication and craftsmanship on a project we have just completed in the Biltmore Estates. From the entry gate, to the massive hanging light fixture, to the metal tracks to slide custom art work on… and of course the fireplace cladding- all superb craftsmanship. The technical and tight tolerances on our specifications were critical to the project’s success and Scott hit the mark every time. Scott and his team did an entry door for my house and it was perfect. The design was amazing and they had it installed and a perfect amount of time. I would use this company again for other items in my home as well as refer them to friends of mine. Scott was involved in the remodel of my new home, he is very hands on and detailed oriented, I trust him and would recommend his work. We would highly recommend Scott and his crew for work involving steel design and fabrication. They created a set of steel doors to hold stained glass for a church in Scottsdale as part of a sanctuary renovation and they did a superb job. Scott was willing to give his creative and artistic energies to our project, exceeding our expectations in the design and craftsmanship of his work. Scott and his crew were capable, conscientious and meticulous in their attention to detail on all aspects of the work. They are awesome. Stopped by with a monitor wall mount that needed a mod and they were able to help me right away – took less than 10 minutes. Would recommend to anyone needing metal work – they will accommodate at a fair price. Thanks! I was looking for a good door supplier and I’m glad I found this company. Very satisfied with their service!! The gentleman that you sent to my home to install two doors was more than pleasant. He did a superb job and was extremely nice. I’m very pleased and writing this letter is a total pleasure for me. I will tell my friends and neighbors about Artistic Alloys & Design!!! They were very knowledgeable, and it was very easy to work with them. Their price was very good. The staff was SUPER nice and told me ten times over that if I had any problems with the welds to just bring it back and they`d take care any problems. I don`t think that this will be the case as the welds are like a work of art. Apparently they built a jig and really took my job seriously which I am very impressed with, especially for the price I paid. If I ever need anything welded that I cannot do myself, I will bring it to Artistic Alloys & Design.